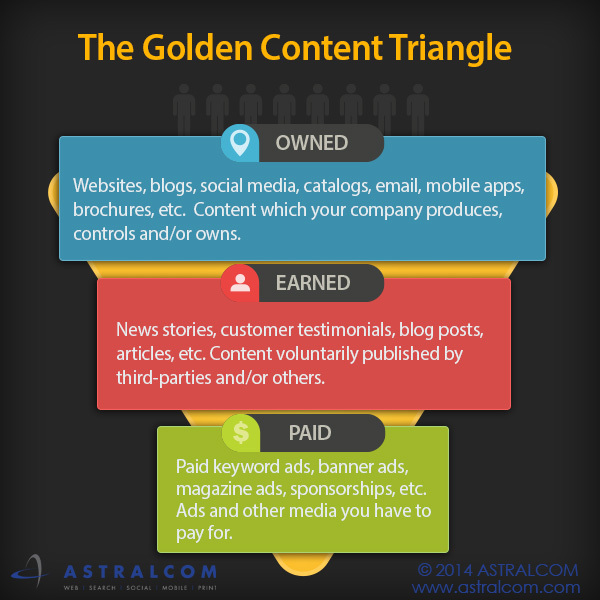 Owned, Earned and Paid: The Golden Content Triangle | ASTRALCOM - Content Strategy, Conversion Marketing and Customer Acquisition. The content tripartite known as Owned, Earned and Paid media has been shaping marketing and advertising for the last five or six years and is proving more important than ever in today’s messaging marketplace. Owned Media and Paid Media both have their place in the content mix, but Earned Media is often considered the holy grail of marketing and customer loyalty. Owned media includes things like your website, social channels, blog, and places you have public-facing content which your company produces, controls and/or owns. Earned media includes things like news stories, blog posts and articles published by third-parties, customer testimonials and/or content voluntarily published by others. Paid media includes things like sponsorships, search engine keyword advertising, banner ads, magazine ads and other media that you have to pay for. Ultimately these types of content work together to lift brand awareness, connect with consumers, build relationships and create sales. The challenge for most businesses, is to keep the Owned, Earned and Paid Content machine running with engaging, informative and relevant content, in all three areas, on a tight budget. The solution here is to develop a content optimization strategy that can be leveraged across channels. Got a content optimization strategy you want to share with our followers? Have an Owned, Earned or Paid media success story that you want to share? 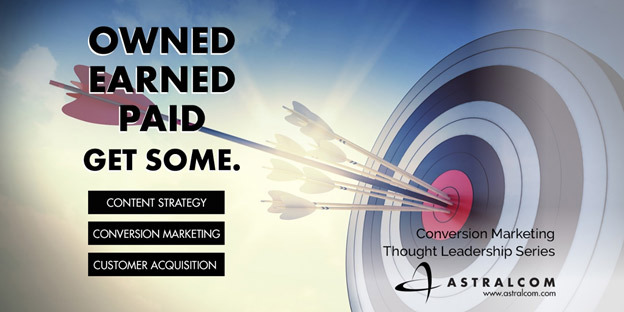 Want a proven optimized content strategy to help you elevate your Owned, Earned and Paid media game? Contact us and you’ll be glad that you did.